While we're planning for 2019, let's not forget we still have one important and busy month to end the year on, December! Can you believe the holiday season is here? 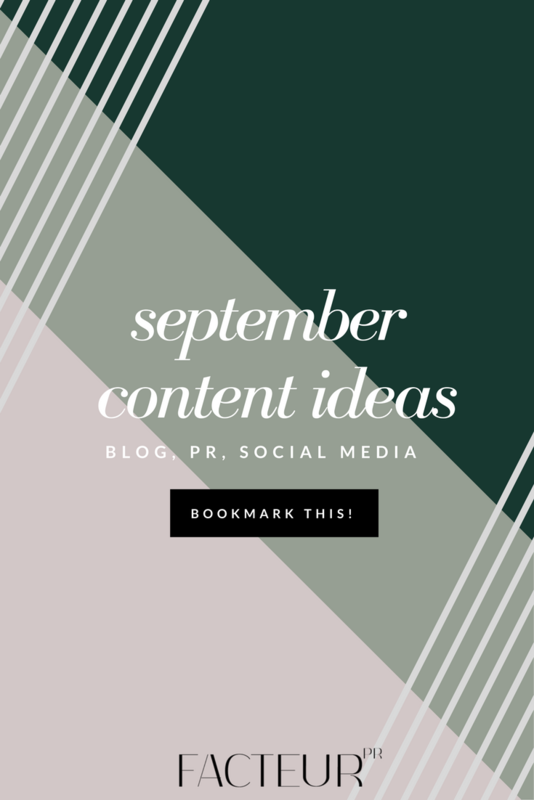 It can definitely be hard to think about making time to curate content for your blog, PR, and social media channels when this month's to-do list seems almost a mile long. Here are just a few opportunities this month to align your brand or business with some already note-worthy happenings online. Want more content ideas? Check out our curated content calendars specifically for the food & drink, arts & hobbies, health & wellness, and lifestyle industries. You can find them under the Instas tab here on the FACTEUR website (and showcased below). We've pulled together social media, blogging, and PR opportunities based on monthly and daily holidays, hashtags, and high profile events that are related to each of those industries. Also included is a list of story ideas to get you started with developing your editorial plan, as well as space to brainstorm your own ideas. Right now, we're offering each calendar for $9, and if you buy all four with our Blogger Bundle, you basically get one free! Plus, every time we update the calendars, we'll make sure you'll get the newest iteration (at no extra charge, of course). Happy creating! Depending on the situation, this time of year is when a brand is either winding down or going full speed ahead to achieve a successful holiday season. As these last few weeks pass by, remember to take a step back and look at everything you and your company has accomplished. Celebrate the successes! However, it is equally as essential to also analyze where improvements can be made. Now is the moment to make time to stop and reflect on what has happened. This activity can be done over the course of a few weeks, or you could sit down and list everything that comes to mind in one go. It is all about making the contemplation session as beneficial as possible! FACTEUR PR has three areas to add to your to-do list, along with some questions to ask yourself that may help with the process. Is your mission statement still accurate? Who has your audience grown to include? Are you staying on-brand with the company’s aesthetics and voice? How does the tone of your content adapt to seasonal/cultural/societal shifts? Take note of what kinds of posts are best received and focus on those. Do this while keeping everything relevant, however. Just because everyone loves a cute puppy photo does not mean it should be utilized over a more relatable image. Content needs to have strong visuals and writing to provide customers with a well-rounded message. It also is important to observe how your target market utilizes social media. Are they actually moving away from Facebook and towards Pinterest? There are trends in not only products and ideas but how individuals access and share them. Don’t forget to keep an eye out! Not sure how to read your audience? Just ask them! Do you have accessible avenues for consumer feedback? Do you encourage follower promotion by re-sharing their content, or do you keep all promotional content in-house? It can be challenging to balance staying true to oneself and following what the customer desires. Because of this, it is a good idea to keep a level of two-way communication. Whether you make a point of responding to followers’ comments and questions on your Instagram posts or have an easy option for leaving online reviews, allowing customers to share their thoughts provides them with a way to feel and be more connected. Also, welcoming images or media that have been created by customers, known as user generated content, can increase brand connections. Both of these improve brand loyalty. This in turn lets a company make more informed decisions moving forward. As you may have noticed, each of these areas are intertwined with the next. How a customer can connect with your brand may often rely on your presence online. The company’s reputation of honesty and/or transparency for the consumer relies on the proper execution of its values through the various physical and digital avenues. This is why we advise for a brand, personal or professional, to unpack these elements at the end of the year to have a fresh, successful start to 2019! Warmest holiday wishes - we can’t wait to see what is to come in the year ahead! Want a tip for approaching your social media in a potentially different way? Treat the drop of a new item like an event! Who wouldn’t want more customer anticipation building up to the release? A good source of inspiration for this kind of strategy is in the fashion industry, specifically how luxury brands engage followers during the release of their collections each season at Fashion Week. An easy way to look at the shared content is in three parts: before, during, and after the event. Instagram, and particularly Instagram Stories, are becoming increasingly important and utilized for brand engagement. Here are some examples of what to look for and share. An elegantly applicable brand to observe is that of Dior, one that is often acknowledged for their extensive social media content. On September 24, the luxury fashion house showed their Spring/Summer 2019 RTW collection in Paris. Its Instagram account utilized the story feature throughout the day. Instead of following the pre-show preparation of a well-known influencer, they featured a fresh-faced model describing each part of the fashion show she experienced (shown above). Luxury brands are often known for being the least transparent in the industry, so any glimpse into the process is widely welcomed. The desire for transparency is growing in consumers at all market segments, so it is a good thing for small businesses to keep in mind as well! Each of the kinds of content described can be translated and pared down to your specific products or services before, during, and after a launch. Post a sneak peek of the cool packaging or a video talking through your sources of inspiration. After the product is released, maintain its new position in the market. Though your business likely does not have the ability to make the volume of content that a brand such as Dior has, sharing a handful of quality visuals in the following days is already a significant reminder to your audience! At FACTEUR PR, we can’t say enough about the importance of continuing on after a big brand moment has happened. Keeping up public relations both online and off is a constant endeavor, so keep it fresh and creative! Looking for assistance with your public relations and social media strategy ahead of your brand or product launch? We can help! Head to our Contact page to get started! Instagram Story images c/o @dior. Cover image c/o Cleo Glover.